“Protecting the South’s Environment through the Power of the Law” is the motto of the Southern Environmental Law Center. SELC is the largest environmental organization in the Southeast, with 60 attorneys working out of nine offices throughout our six states (Virginia, Alabama, Georgia, Tennessee, North and South Carolina) and on Capitol Hill. 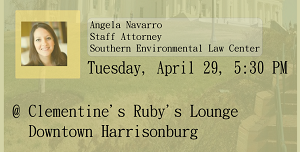 The Climate Action Alliance of the Valley is excited to be bringing Angela Navarro, one of 12 SELC attorneys at the Virginia office in Charlottesville, to our April 29 forum, 5:30—7:00 PM in Ruby’s at Clementine, 153 S. Main St., downtown Harrisonburg. SELC chooses its work for maximum impact—to set important precedents or to strengthen and enforce far-reaching policy—but it also pursues dozens of site-specific cases and projects to protect places too special to lose, like George Washington National Forest. Angela has particular expertise in two areas of great interest to Harrisonburg/Rockingham County: Energy Efficiency: the cleanest, cheapest energy resource, and Solar Power. CAAV has been working with others in the HR/Green Network to support the city in increasing the energy efficiency of municipal buildings and has often partnered with other groups to get Dominion Power to increase its renewable energy resources and encourage, not discourage consumer solar panel installations. SELC pursues the same goals but in ways that we don’t often get to hear about. We invite you to join us in Ruby’s to find out how SELC is working to lower Virginia’s carbon emissions and to protect our environment. Come early and enjoy food and drink from the bar, then learn about clean energy and ask questions of an expert.